Siempre Azul - Magnificent Secluded Oceanfront Villa for 2! The private St John Villa Siempré Azul, named for the remarkably rich variants of blue sky and water above and below, is a custom Caribbean villa rental located above Friis Bay, just south of the quiet St. John, USVI, community of Coral Bay. Perched not far above the surf, this luxury villa's oceanfront view is spectacular! From north to south your eyes will travel the blue waters from Coral Bay Harbor, past East End and on out to the dancing Caribbean sea. Siempré Azul is intimately secluded (perfect for Honeymoons) yet conveniently close to beaches, hiking trails, and to Coral Bay's unique shops and dining spots. This private villa is a perfect choice for your tropical retreat. I am custom home builder both on St. John and in New Jersey. I built Siempre Azul from the ground up. I purchased this one of kind property in 1990. Construction was completed in 2000 with constant fine tuning and continous upgrades. If I am not working you can find me on or in the water. My hobbies are surfing, snorkeling, boating, kayaking and hiking all the trails on St. john. I am a licensed pilot rated in both helicopters and fixed wing aircraft. I also enjoy racing nascar and have competed at the Las Vegas Speedway, Talladega Super Speedway in Alabama, Miami Speedway, Myrtle Beach Speedway and Charlotte Motor Speedway at speeds approaching 200 MPH. Siempre Azul a spectacular ocean front property that is totally private and secluded yet minutes away from all the pristine white sand beaches and fine dinning in coral bay. The house is custom built out of natural stone both inside and out. The stone was hand split at the St. Thomas rock quarry. All the interior hardwoods were milled and fabricated into custom cabinetry and trim on site. my personnel attention was given to every detail during the construction process. This property is a one of kind piece of paradise perfect for that special time to share with that special person in your life. please take a few minutes to read the many 5 star reviews on home away or VRBO. Lovely custom tiled, beautiful mahogany woodwork cabinetry. Fabulous Outdoor garden shower next to the new hot tub! St John has a host of world famous beaches each having their own characteristics- you are sure to find your favorite ! Everything about this home, location and view met our expectations. Perfect for a two person getaway. We hit the beaches in the morning/early afternoon and returned home most evenings to cook in the well-stocked kitchen, soak in the hot tub and enjoy a game of horse shoes. Will definitely return. We couldn't have picked a better place for our anniversary trip to St. John. We have visited St. John several times in the past but had always stayed on the Cruz Bay side. I was a little apprehensive about staying way over on the east side, but it was absolutely amazing. The house was perfect...great view, right on the water, amazing hot tub, easy drive, and you can walk to Miss Lucy's! Getting to the sights and beaches was easy...maybe even quicker than from the west end. Salt Pond is less than 5 minutes away! We were also amazed at the amount of grocery stores and restaurants. Thank you to Chris (owner) and Steve (manager) for helping us with such a fabulous trip! We really enjoyed this house, and Chris, the owner was super helpful. If you take a look at the drone video available on YouTube, you will get a very accurate view of the place. The only real surprise for us was that the pond adjacent to the house is a bit stinky. Mostly not a problem, because the prevailing winds blow the other way. But when the wind changes direction, it's a bit funky. Loved the very private feel of the place. We spent most of our 10 days on St. John just hanging out at the house, relaxing. Just sitting on the balcony, gazing out at Coral Bay, and enjoying the gentle breezes was very nice. The house is clean and well maintained. There is plenty of gear in the kitchen for meal prep, and there is even some beach gear in the garage. This is a private, well cared for place that’s right on the water with amazing views of the bay and out to the BVI and beyond. We really appreciated the attentiveness to detail that was evident everywhere. Some great beach chairs were available, the towels were plush, the bed was comfy, and the porch was a great place to eat. There’s also a hot tub/spa, an outdoor grill and dining area, and horseshoes. The owner and property manager made sure to be available to answer any questions, and the instructions for using things were clear. All in all a great place to relax and enjoy the Caribbean sunshine and breezes. I love Coral Bay, and from now on will always stay on that side of the island! What a true vacation--no make up, no drying hair, outdoor shower, clothing optional, great eating close by. Waking up to the beautiful sun rise and listening to the waves from bed was absolute heavenly. A Krista Kremer massage is a must, she will travel to you and there is the perfect secluded spot for the couples massage on site. Seimpre Azul lived up to all of our expectations and more. Chris was so easy to communicate with and his island manager was a sweetheart as well. We will return for sure!!!! Our little week in paradise. Islanders are recovering from the hurricanes but are so thankful for tourist returning to St. John. Thanks for the nice review and glad you enjoyed the house. Please come back again like so many of my guests do. This little villa is an absolute pleasure. Magnificent views, delightful accommodations and a superb location made our stay very enjoyable. You can tell how much care and thought has gone into putting the place together. Well situated, you are mere minutes from the great beach, hiking and snorkeling of Salt Pond, and a few more to Hansen Bay and North Haulover (a favorite). Mid-day or dinner, fine food is just steps away at at Miss Lucy’s (we just walked...) or a short drive to a few other excellent options. Highly recommend! Thank you for the kind remarks about my ocean front home. I work tirelessly to keep the place polished to earn your stars. Please come back again like so many of my guest do. 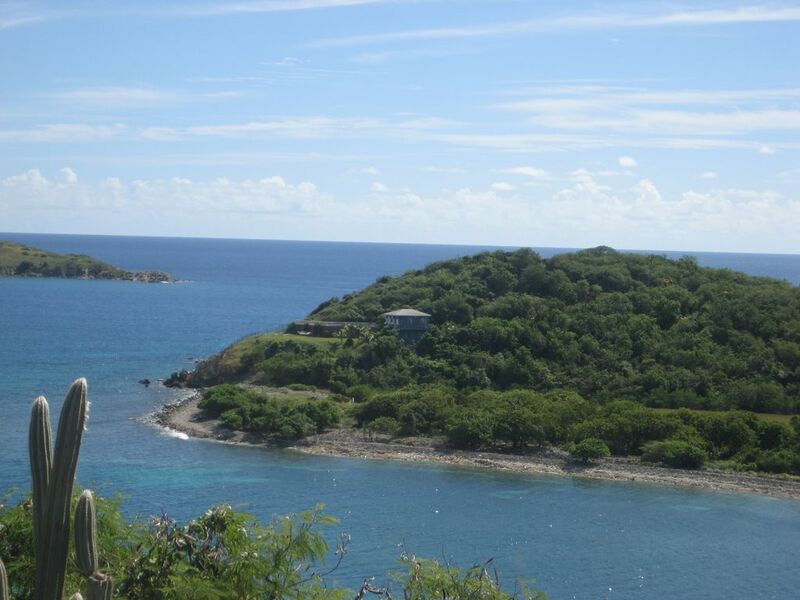 The island of St. John is the smallest and quietest of the US Virgin islands. An 8 mile, 30 minute scenic drive east will take you from Cruz Bay, the main restaurant and excellent shopping area to the smaller community of Coral Bay. Siempre Azul is not far from the Salt Pond beach at the southern tip. Ramshead hiking trail starts here and meanders up the mountain to a dazzling 200 ft. high panoramic view. Several local beaches are found here while St John's famous beaches are dotted along the North Shore. Archaeological findings, many ruins and interesting hiking trails abound.